Yes, you. I know what it feels like to search for this truth. But friend, you do not need to search any longer. You are loved, just the way you are. Not for anything that you DO, but simply because of who you are. Your Rescuer, He has come, for you. You do not need to earn His love. He loved you before the world was ever created. He desired an intimate relationship with you, so He knit you together in the secret place, in the womb of your mother, and breathed life into you. You were made to love and be loved. He loves you, and through His love, you are given the ability to love others. His love for you is unending. It will never fade. If you did nothing else for Him, He would love you still. And those mistakes you say you keep making? He forgives, and He forgets. His love reaches to the heavens. It’s deeper than any ocean. Nothing will ever separate you from it. Do you know how you move His heart? He longs to hear your voice. Do you know how captivated He is when you look at Him? He cannot take His eyes off of you. You are perfect in His eyes. You are beautiful beyond comparison. If you were the only person on this earth, He would have still come, just for you. You, my friend, are loved. Take a deep breath and rest in this truth today. *A pastor who pursues the heart of God with passion and integrity. *The ability to multitask and get things done. *A coupon for a free cheeseburger, for me and a friend. *Friends who see clearly when my vision is cloudy. *Worship that takes you deeper into His presence. *A puppy who keeps my lap warm. *Learning to move with the wind of His Spirit. *My church staff and friends. *The power to speak life over myself. What are you thankful for today my friend? I would love for you to share in the comments below. Linking up with these beautiful communities today. Oh wow, did my soul need this this morning. I may have cried while reading it. I desperately needed the reminder that nothing can separate me from His love. Thank you, Barbie! I’m so glad you linked up with New Every Morning. You words bless, friend! Loved reading the words, “You were made to love and be loved.” My prayer today is that others would feel His love through me. Thank you, Barbie, for these words. Thanks my prayer too Joanne! Blessings! 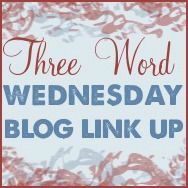 Thanks so much for linking-up today! Glad I popped in this morning. What a beautiful encouragement to leave for work with. Resting in the truth that I don’t have to do anything to earn his love, just accept and soak it in. God’s love is something we all know – right? But I find it so hard sometimes to really comprehend. Comprehend so it is in my heart, so it affects the way I live, so it is the foundation of what I stand on. I think we all need to reflect on words that describe God’s beautiful love for us regularly so we have them constantly pouring into us diluting all the other influences we face in life. Thanks for this gift of your words today, Barbara! Mel, I am so thankful you stopped by so that I could find your beautiful blog. I look forward to getting to know you more. Oh am I glad I came here before calling it a night. What beautiful truth to let soak in as I sleep. Thank you my friend. And love your gifts. It’s such a joy to be counting together. Have a beautiful tomorrow my friend! You and I are so much alike. Thank you for sharing. Blessings! Your words bless me so, sweet Barbie! Thank you! So glad you stopped by Lydia! Thanks for this, Barbie. It is exactly what I needed to hear today! I was thinking about our daughter today and trying to figure out why she has turned away from God, from us, and from our love. I may never know the answer but what I do know about God comforts me greatly! He loves me and He loves her. I am so thankful! P.S. Love the rose…did you see my rose today? Joan, YES! He loves you and He loves your daughter. I cannot imagine any of my children walking away from what they’ve known. It’s only by God’s grace they are still walking the right path. I did see your roses! Beautiful! Thank you for this beautiful truth. Sometimes it’s easy to overlook, among all the self-critical thoughts. Your opening words reminded me of a truth I found myself noticing recently…God wanted me to be born, no matter that there was no further planning on my parents’ part…no matter that I was born prematurely…no matter that I had poor lungs. He wanted me here, and here I am! Blessings! And I am so thankful you are here! Have a beautiful weekend my friend! So gently and beautifully put! An unexpected day off for my husband. New beauty to be found. The coffee that waiting for me this afternoon. I’m thankful for you Elizabeth. And fresh coffee is always good. Have a lovely day. I love reading this encouragement, it’s such a blessing to have real women speaking truth. Thank you Barbie! Thank you Sarah! I look forward to catching up on your words later today. This just brings a smile to my heart. You are the second post I have read today about God’s love for me. Oh how He loves us so! Have a beautiful day my friend. So thankful you were blessed Tara. Have a beautiful day. Thanks for stopping by Alissa! Blessings!